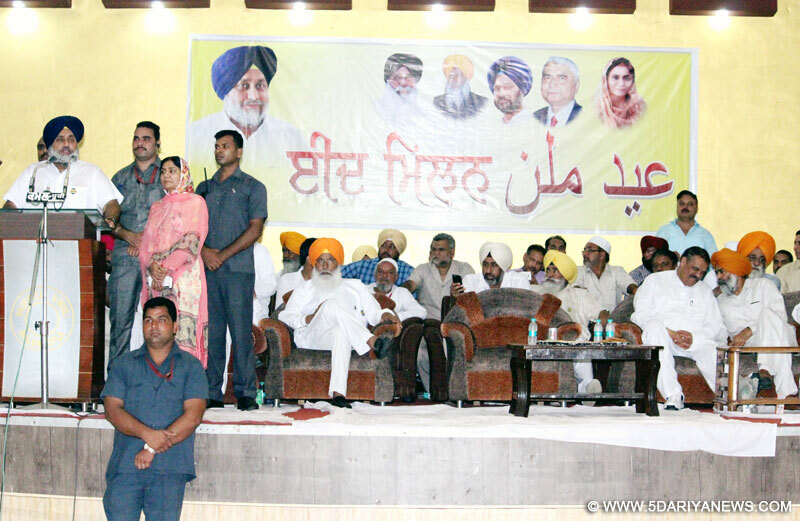 Punjab Deputy Chief Minister Sukhbir Singh Badal today extended Eid-ul-Zuha greetings to members of the Muslim community during a function organized at Hina Haveli here today.Addressing the huge gathering on this occasion, S. Badal affirmed that the SAD-BJP government under the able leadership of Chief Minister S. Parkash Singh Badal has always accorded deep respect to every religion and as a part of its commitment towards welfare of all sans differences of caste, creed, race and religion, the Punjab government has made it a point to observe sacred days of all religions. He said that Punjab government has launched Mukh Mantri Tirath Yatra scheme to facilitate people of all religions to pay homage at sacred places located far across the nation.Fulfilling the long-pending demands of Muslim and Christian community, Deputy Chief Minister announced that Government would construct Deputy Chief Minister announced that in the next 3 months Rs. 100 crores to be spent to carve out burial grounds in all the cities and villages where Muslims and Christians have dense population to eliminate hurdles of these communities while performing last rites for departed souls. He also announced to hold 2 days Sangat Darshan program in Malerkotla during next month to solve the grievances of people of Malerkotla besides meeting the development requirements of the city. Strongly condemning the unfortunate incident happened in the city few days back, Deputy Chief Minister reiterated the state government’s commitment that no one would be allowed to vitiate the hard earned atmosphere of peace and communal harmony in the state. He said that Punjab has always rejected such nefarious designs of agencies or political parties and the law enforcing agencies were keeping a round the clock vigil against any attempts to create disturbance in the state. He said that people of Punjab would teach historic lesson to Congress and Aam Admi Party (AAP) for defaming Punjabis as drug addicts. Describing AAP’s youth manifesto as an ‘Air Castle’, Mr. Badal said that Delhi CM Mr. Arvind Kejriwal should spell the number of jobs he had provided to youth in Delhi before misleading Punjabi Youth.Earlier, union state minister Mr. Vijay Sampla, Member parliament Mr. Sukhdev Singh Dhindsa and Mr. Izhar Alam also extended Eid-ul-Zuha greetings to members of the Muslim community.Prominent amongst others Ms. Farzana Alam, Sant Balbir Singh Ghunas, Mr. Parkash Chand Garg, all CPS, former minister Mr. Gobind Singh Kanjla and Mr. Iqbal Singh Jhunda, MLA, Special Principal Secretary to Deputy CM Manvesh Singh Sidhu were Deputy Commissioner Arshdeep Singh Thind were also present on the occasion.